During the past few months, some of our members who are living with breast cancer came to us concerned about the cosmetic products used in a program called Look Good, Feel Better®. Look Good, Feel Better is run by the American Cancer Society, the largest cancer charity in the U.S., and the Personal Care Products Council, the largest national trade group for the cosmetics industry. The program holds free workshops that give beauty tips and complimentary makeup kits to women in cancer treatment. 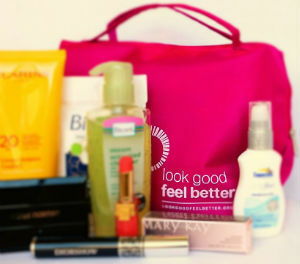 The way the Look Good, Feel Better program works is that member companies of the Personal Care Products Council donate cosmetic products for the kits given to cancer patients. The American Cancer Society administers the program nationwide. Cosmetologists donate their time to run the workshops. When we saw that the companies donating cosmetics included infamous pinkwashers like Avon and Estee Lauder, we were troubled. Cosmetics and personal care products are notoriously full of toxic chemicals, but we hoped that products given to cancer patients would be held to a higher standard. Unfortunately, that’s not the case. Parabens: Parabens are chemicals often used as preservatives in personal care products and can be absorbed through the skin. These chemicals may increase breast cancer risk by mimicking the hormone estrogen. Common parabens include methylparaben, propylparaben and ethylparaben. Because breast cancer is a hormone-driven disease, common treatments target our hormones—and hormone disruptors like parabens may interfere with the effectiveness of breast cancer treatment. A study found that breast cells that have been exposed to methylparaben are less responsive to the common breast cancer hormone therapy, Tamoxifen. Formaldehyde releasers: Formaldehyde releasers are also used to preserve personal care products and can be absorbed through the skin. These chemicals slowly and continuously release small amounts of formaldehyde, a known human carcinogen. Common formaldehyde releasers include diazolidinyl urea and DMDM hydantoin. Fragrance: “Fragrance” is a term used by companies to hide ingredients under the assertion that they are “trade secrets.” The International Fragrance Association, an industry trade group, published a “transparency list” of more than 3,000 chemicals commonly used in fragrance. From this list, we know that “fragrance” conceals hormone disruptors and carcinogens. Fragrance also conceals sensitizers, allergenic fragrance ingredients that can, through repeated, cumulative exposure trigger asthma, sneezing, headaches, and contact dermatitis and is particularly concerning for women in cancer treatment. Polytetrafluoroethylene (PTFE): Commonly known as Teflon (yes, that Teflon), this ingredient is used in cosmetics for smoother application and to fill in lines and wrinkles on skin. PTFE can be contaminated with the possible carcinogen and hormone disruptor perfluorooctonoic acid (PFOA), which is linked to altering mammary gland development. That’s just a sample of the chemicals of concern we uncovered. And because no Look Good, Feel Better kit is the same, there’s no telling what’s in the kits you or someone you care about may receive. The program’s products aren’t just putting cancer patients at risk, but also the program’s volunteer cosmetologists. A recent report found that the breast cancer risk for cosmetologists is five times higher than the general population. And the health risks extend beyond women participating in the workshops. The toxic cosmetics found in Look Good, Feel Better kits are the same products commonly found on our local store shelves. Currently, the regulation of cosmetic products is a sham. The personal care products industry is one of the least regulated industries in the U.S. Companies are not required to demonstrate a product is safe before it lands on store shelves—or in makeup kits. And the Personal Care Products Council spends millions of dollars lobbying against cosmetic safety regulations to make sure it stays that way. Cosmetics companies claim that exposure to chemicals linked to increased cancer risk at low doses is harmless. But a clear and growing body of scientific evidence points to the role of environmental exposures, specifically human carcinogens and endocrine disrupting chemicals—even in low doses—in increasing women’s risk of breast cancer. And it’s important to remember that these doses add up. After all, these are products used daily. The average woman uses 12 personal care products each day, containing 168 unique ingredients. If you want to learn more about chemicals used in cosmetics, our friends at the Campaign for Safe Cosmetics and the Environmental Working Group have great resources. But none of us should have to get a science degree to figure out if a product is safe. And safe products should not just be available to people with the resources to afford them. That’s why we need systemic change. The American Cancer Society and the Personal Care Products Council are in a position to be leaders in setting the highest standard for the cosmetic industry. We are calling on these multi-million dollar industry giants to ensure that no women, especially cancer patients, are exposed to chemicals in personal care products that put their health at risk. As a first step in demonstrating this commitment, we are demanding these industry giants block any company from participating in the Look Good, Feel Better program if the chemicals used in their products are linked to increased breast cancer risk or interfere with breast cancer treatments. Please join us in standing up for women’s health by taking action now!